He won a pair of BCS Championships and coached the program's most revered star, but how will Gator fans remember Urban Meyer? Since former University of Florida and New England Patriots tight end Aaron Hernandez was charged with murder, the less-than-disciplinarian management style of former Gator coach Urban Meyer has once again entered the public consciousness. This isn't the first time Meyer has been called out for losing control of the Florida program. When current Gator coach Will Muschamp took over in Gainesville, he spoke repeatedly about a need to "change the culture," and fix the program. One of the first moves he made with that in mind was dismissing star cornerback Janoris Jenkins after the All American was arrested for possession of marijuana. Amid a full-blown Meyer backlash, it is Jenkins' remarks from 2011 about being dismissed by Muschamp that have come to define Urban's off-field legacy at Florida. 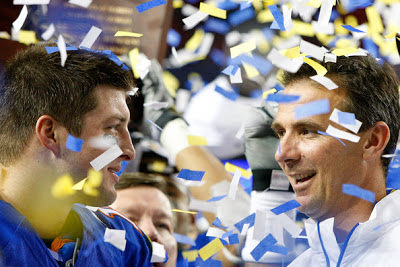 "No doubt, if Coach Meyer were still coaching, I'd still be playing for the Gators," Jenkins told the Orlando Sentinel. "Coach Meyer knows what it takes to win." Clearly, Meyer does know what it takes to win. Now the coach of the Ohio State Buckeyes, Meyer is coming off a perfect 12-0 season (The Bucks were ineligible for postseason play in 2012) and has his program poised to contend for national titles for the foreseeable future. During his time in Gainesville, the "Urban Legend" ushered in what will surely be called "the good old days" years from now by all my friends that went to UF. From 2006-2008, the Gators won a pair of BCS National Championships and Tim Tebow became the first sophomore ever to win the Heisman Trophy. Add in a pair of NCAA Tournament championships by the Gator men's basketball team and it truly was "Great to Be a Florida Gator." Only the rise of Nick Saban at Alabama could stop Meyer and the Gators from winning three titles in four years, the true mark of one of college football's all-time greatest teams (A mark Saban has now reached in Tuscaloosa). On the field, Meyer is a brilliant tactician. Blending the spread and Air Raid passing principles of innovators Jack Elway, Joe Tiller and Norm Chow with the zone-read concepts popularized by Rich Rodriguez, Meyer has built one of college football's most unstoppable schemes ever. Off the field, Jenkins' quote raises the real question that needs to be asked here: What does it take to win at the highest level in college football's high stakes arms race? Meyer ran a program that averaged around six arrests per season from 2005-2010, with those arrests ranging from the "boys will be boys" public intox cases, to theft and assault felonies. Hernandez, who had been a person of interest in a 2007 Gainesville shooting before the victim mysteriously withdrew his identification of the tight end, now adds to the list of high profile Gators arrested in college or the pros. A list that includes his former teammates Jenkins, Chris Rainey, Brandon Spikes and Cam Newton, all star recruits brought in by Meyer. So what will Meyer's legacy be at Florida? Many Gator fans have wasted no time jumping off his bandwagon, and he's certainly given them reason to. As soon as the Gators began to struggle on the field and the program spiraled further out of control off the field, Meyer took time away from football to deal with health issues. Certainly fair enough if those issues were legitimate, but after an 8-5 season in 2010, Meyer walked away from the Gator program to "spend more time with his family." Never mind the fact that his daughters were about to begin college, Meyer emerged a year later as the new head coach of Ohio State. Since becoming the head man in Columbus, Meyer has even gone on to endorse a report of his former school to the NCAA for recruiting violations. If he cares at all to be loved in Gainesville, he sure isn't showing it. Still, it's hard to deny what the man meant to the Florida football program. He took the Gators to new heights, winning the program's second and third national championships, and coached the most revered player in Florida history, Tim Tebow. So, do we simply have to take the good with the bad if we want our favorite team to win in college football? After all, this isn't the NFL with a salary cap and revenue sharing. The stakes are also far higher for college coaches as one loss could mean a lost season, and mega-contracts have led to unrealistic expectations from alumni and boosters. It seems like, with the current construction of college football, you need to sell your soul to win big. Whether it's covering for your players like Meyer or Jim Tressel at Ohio State, flat-out cheating to score prized recruits like Pete Carroll at USC, or committing academic fraud to keep players eligible the way Bobby Bowden did at Florida State, every recent power program has some dirty laundry. If you want to look back at several other "good old days" periods, you'll find that Bear Bryant succeeded using only white players in a segregated SEC, Woody Hayes won using intimidation and physical threats against his players at Ohio State, and Miami was at its best on the field when its players were at their worst off of it. So, while one of his former players is being charged with murder, it's hard to hold too much of this against Urban Meyer individually without blaming the entire corrupt system. If you want to call him an enabler, that's fine, just understand that pretty much every other successful college coach would have acted the same way. Oh yeah, and if Meyer didn't recruit Hernandez, some other coach would have, and he'd probably be in the same spot now. It doesn't make it right, but ultimately, I think people will look back on Meyer's Gator years as a golden era of Florida football. The same way Kentucky fans only mention Adolph Rupp's point-shaving scandal and well documented racism as a foot note next to his five basketball national championships, so too will Gators fans remember Tebow's tear-filled speech and subsequent title run more than Meyer's penchant for coddling troubled stars. Just for a little background on other "renegade" football programs, here are the rap sheets of a few legendary coaches below. Alabama under Nick Saban: The Crimson Tide just kicked four players off the team for theft, one a five star recruit from Florida. But, Alabama has actually been middle-of-the-road when it comes to criminal activity, at least by SEC standards, the last four years. Furthermore, when players have gotten in trouble, they seem to be punished. Florida under Urban Meyer: Between five and six arrests per season, ranging from disorderly conduct to theft, domestic violence and assault. The most troubling incidents are the multiple chances given to players like Chris Rainey and the absolute non-reaction to Hernandez being accused of shooting a man in the head. USC under Pete Carroll: Rampant cheating in the forms of recruiting violations and gifts to players once they were in campus, culminating in Carroll's departure for the NFL and Reggie Bush forfeiting his Heisman Trophy. Ohio State under Jim Tressel: Numerous high-profile players had run-ins with the law, and Maurice Clarrett's saga is one Buckeye fans won't soon forget. Tressel was forced out after it was discovered that the owner of a local tattoo parlor had a financial agreement with several Buckeye players that involved swapping Ohio State memorabilia for ink. Florida State under Bobby Bowden: Numerous cheating scandals and accusations of academic fraud. Bowden's "good old boy" persona shielded him from a great deal of criticism when he gave several talented players second and third chances. Miami under Butch Davis and Larry Coker: Multiple arrests per year, and the program eventually came undone when it was revealed that Nevin Shapiro was using ponzi scheme money to pay off players. Nebraska under Tom Osborne: A model of consistency (Never winning less than nine games in his 25 years at the helm of the Huskers program), Osborne won three national title in four seasons in the mid 90s and saw his team ranked in the top-15 for 24 of his 25 seasons. He also had a solid record of producing model citizens and disciplining players that deserved it. Well, except for Lawrence Phillips, the star running back that was arrested for beating his girl friend in 1995. Osborne only suspended the troubled tailback for six games, and even started him in Nebraska's 62-24 demolition of Florida in the national championship game. Miami During "The U" Years: You really just need to watch the 30 for 30, it's pretty epic. Penn State under Joe Paterno: You know. Ohio State under Woody Hayes: He pretty much Bobby Knighted his kids… And sometimes other teams' kids. UF was dramatically worse with criminal actions by their players than any other school while under Urban. Comparing some kids at FSU getting the answers for a music test from a tutor is like comparing a slap in the face to a gunshot to the face. Meyer is as grimy as it gets.